Alyssa and Brian’s Temple Sugar Bush summer wedding was so classic and refreshing—and completely filled with love! It’s so fun to work with couples who are focused on not only their relationship and the start of a beautiful marriage but also care about the small details. And this is definitely the case with these two! Alyssa is a huge planner and wanted everything to be perfect on their big day (and rightfully so! ); they sent out a seven-page document to their wedding party with all of the great details they had planned… and booked me two full years before their wedding! It’s such an honor to be able to have a couple emphasize so much how important it is to them that I capture their wedding day and book me so far in advance, and I loved having the chance to get to know them so well before their big day! It’s so fun to have been able to witness different styles of ceremonies over the years as an Ottawa wedding photographer. Brian and Alyssa had been legally wed the day before, during a private church ceremony, so their day was one hundred percent celebration: a sweet and personal lock box and sand ceremony, heartfelt speeches (and a delicious maple chicken dinner! ), and of course a celebration! The day started with the boys hitting the links with a relaxing game of golf at Grey Gawk Golf Course, and then they prepped for the wedding at the venue, while the girls spent the morning primping in Alyssa’s parent’s house, which was a laid-back morning filled with lots of snacks and makeup. The wedding details and girls all looked amazing in the abundance of natural light in the house! 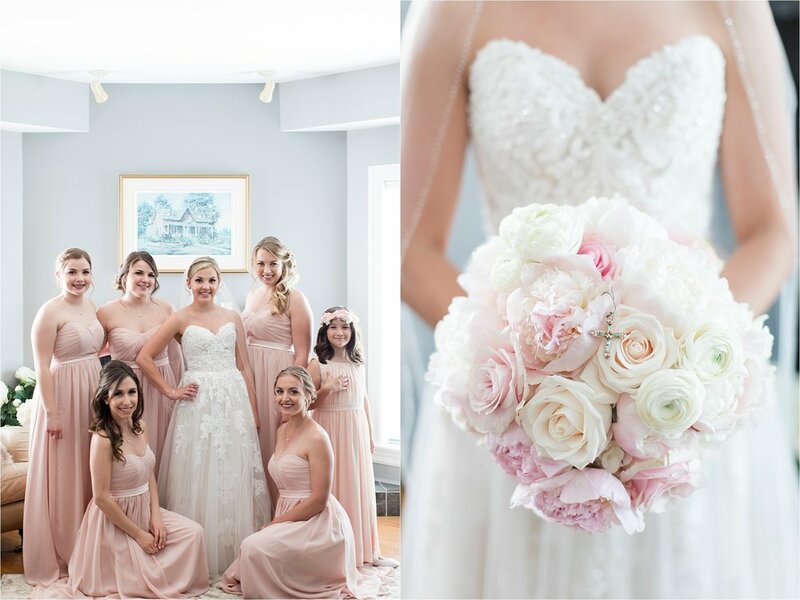 Alyssa looked stunning in her traditional, A-line Bridals by Almor dress with a relaxed updo and sweet braid, and the wedding came together perfectly with a classic palette of blush and grey. The girls were beautiful in their flowy pink bridesmaid dresses, and I love that Alyssa broke some of the rules and included a bridesman in her lineup; they had met and become close at school, and she really wanted hi to be a part of her big day. Bryan was dapper in his grey tux and pink bowtie, and the whole look was pulled together beautifully with the most incredible ombre bouquet of roses and peonies. Rebel Petal really outdid themselves with the bouquet of fluffy goodness! Beyond being a day filled with so much happiness, it was so exciting for the guests (and me!) to find little surprise details around every corner. Their maple syrup favors were sweet and perfect for any Canadian wedding, and the venue was filled with amazing vintage elements and sweet floral arrangements. I always love shooting at Temples Sugar Bush because it’s such a small but personal venue, and the trees are always so green, and the staff is always friendly! Alyssa and Bryan picked out such a wonderful team of vendors: Up North Wedding Films (who have already finished their video, and it’s to die for!) and Sweet Clementines (who I have been lucky to work with a few times this season, and her stuff is always heavenly!). These two were some of the best ever to work with—so young, happy, and in-love and absolutely perfect for each other! Thanks for letting me part of your day, you guys!